Is there anything better than a plate full of cinnamon rolls? 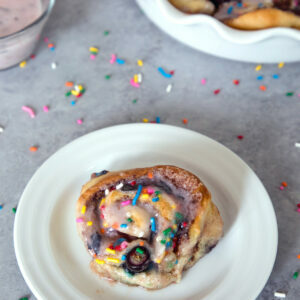 How about a plate full of Blueberry Funfetti Cinnamon Rolls? These will make your kitchen smell amazing and are the perfect addition to weekend brunch! Heat milk, vegetable oil, and 1/2 cup sugar in a medium saucepan over medium heat. Let it get really hot, but remove from heat right before it comes to a boil. Set aside and let cool to luke warm. Pour milk mixture into a large bowl. Sprinkle yeast over milk mixture and let sit for about 1 minute. Add 4 cups of the flour to the bowl and stir until just combined. Cover with a clean kitchen towel and set aside in a relatively warm place to rise for an hour. Remove towel and add baking powder, baking soda, salt and remaining 1/2 cup of flour and stir thoroughly to combine. Place dough on a lightly floured surface and roll it into a large rectangle, about 30×10 inches. Pour 1 Tbsp of the melted butter each into two round baking dishes or pie plates (you can also use disposable foil cake pans). Pour remaining melted butter over the surface of the dough and use fingers or a pastry brush to spread the butter evenly. Generously sprinkle ground cinnamon and 3/4 cup sugar over the butter and top with blueberries and rainbow sprinkles. Starting at the long end farthest from you, roll the dough tightly toward you. Use both hands to roll evenly and work slowly. Pinch the seams together at ends. Transfer dough to a cutting board and using a sharp knife, cut dough into 1-inch slices. Place rolls into the pans, but be sure not to overcrowd them. Cover the rolls with a kitchen towel for about 20 minutes, so they can rise again. While they're rising, pre-heat oven to 375 degrees. Place them in the oven at 375 degrees for 16-20 minutes, until they're turning golden around the edges. Remove cinnamon rolls from oven and immediately pour icing over them. Place blueberries in a medium bowl and use a fork or masher to mash together. Add powdered sugar and whole milk and whisk together until smooth. To make cinnamon rolls ahead of time, you can cover bowl tightly with plastic wrap and place in fridge for up to three days after performing step 6 and finish rolling dough and forming rolls when ready. You can also place rolls in fridge overnight or in the freezer for longer after arranging them in the pan (step 14) and covering tightly with plastic wrap. Simply bring to room temperature and bake when ready.